From highlighting their lives in farming to writing about childcare, books and mental health, farming blogs can be a great platform to air your agricultural voice. Today, farmers look to other fellow farmers for inspiration and answers to their questions. Query anything on social media and someone will get back to you, offering up their personal experiences or, if unable to help they will certainly point you in the right direction. Blogging can open many doors, from allowing the more taboo subjects to be spoken about freely, to highlighting the hard work our British farmers do and below are just some of those creating epic change through their passion for agriculture. Farmers Wife and Mummy - Blogging her way through pregnancy, farm life and family ways, Emma Lander has created a site where you can find anything from make-up talk to the best farming books for children. Living in the countryside and on a working farm, her stories are always full of life and interesting anecdotes based on her children. Girl About the Farm – From marketing to farming, Laura Hodgkins left her life in the city to start a brand-new career in farming with her husband, Andy. She has since created a blog documenting her journey, brimming with beautiful photography and insights in to her fresh start. Rock and Roll Farming (Will Evans) - Farmers Guardian’s Digital Innovator of the Year at the British Farming Awards 2017, Will’s infamous podcast, Rock and Roll Farming, has broken the mould when it comes to how we talk about the industry. Touching on everything from depression to young farmers and talking to some of farming’s most influential characters, Will really is using this platform to shed some positive light on our industry. 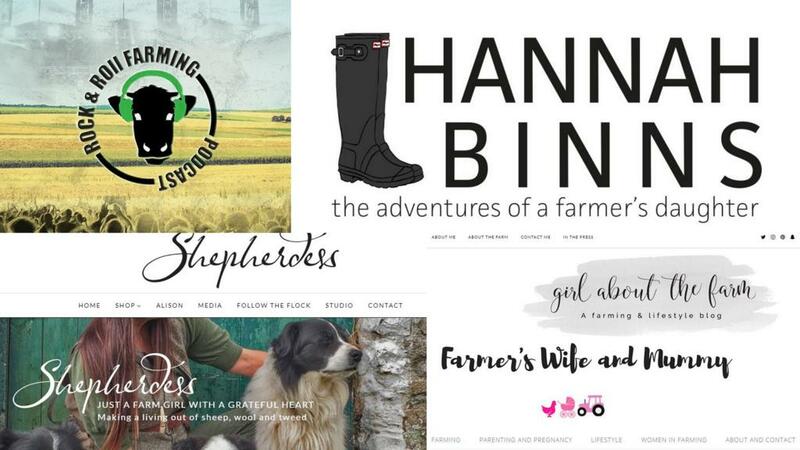 Hannah Binns – Hannah’s site, with the tagline ‘the adventures of a farmer’s daughter’, documents her life on-farm, with a passion for showcasing agriculture at its best. As she says, pop your wellies on, grab a cup of tea and have a nosey at all the farm-related things she gets up to. This is a great one for young farmers to take inspiration from. Tom Martin – The mastermind behind ‘Facetime a farmer’, Tom’s goal is to showcase the industry and is particularly interested in locally sourced produce. He posts videos, articles and images on his Facebook page and plays a huge role in voicing shared concerns and passions from farmers themselves. The Wife Behind the Farmer – Hannah Morgan’s blog is dedicated to covering all things countryside related including fashion, family and travel. Covering rural events and offering snippets in to their days on-farm, this blog is definitely fun filled. Female Farmer UK – After starting up her own educational smallholding from scratch, Katie Anderson has come such a long way. Her site, Female Farmer UK - Musings of a first-generation farmer, is an eclectic mix of recipes, personal stories and insights in to what life is like starting up a new business. Alison O’Neil – Alison’s journey began after combining her eye for design with her passion for wool provenance and 'Shepherdess' was born. Her website truly embodies everything Alison loves, with her stunning, crisp photography and her motive to entwine culture, heritage and detail in her clothes. Georgina Gater-Moore – Georgina entered the industry with nothing but passion and as her bio says, farming wasn’t the plan after studying drama, English literature and Classical Civilisation. But after realising where her heart was, she ended up at Harper Adams and her blog combines her love for writing and for the industry. FG Blogs - Our blog section features a wide variety of posts from figures across the industry - Michael Gove, young farmers, agronomists, tutors, mothers. You will find information from farming sectors, written by the people right at the heart of farming.